I think this book is a masterpiece. And I'll tell you why. We think we know the issues which surround racial prejudice so well, that it is difficult to be persuaded to think afresh. Theodore Taylor will make you do that. He takes the plain statement that we are all the same under the skin and illustrates it with a devastatingly simple story. It is 1942, Phillip is twelve years old and lives with his parents on the island of Curacao, off Venezuela, though he is in fact American. As the war worsens, Phillip's mother wants to take him back to America where he will be safer, so they board a small Dutch freighter, the SS Hato. But the ship is torpedoed and during the evacuation process Phillip receives a crashing blow on the head. He recovers consciousness to find himself alone on an open raft in the middle of an empty sea, with a dully aching head. Actually, he isn't alone. On the raft with him is the biggest, oldest, ugliest black man he has ever seen, and the ship's cat, Stew. Now, Phillip doesn't particularly have views about black people himself. He's never had anything to do with them. But he does know that his mother doesn't like black people. Equipped with his mother's views, Phillip's relationship with old Timothy gets off to a poor start - though it isn't particularly surprising that he chews Timothy's head off a bit. After all, Phillip is only twelve, he's just been torpedoed, lost his mother, possibly she has drowned, he's cast adrift on an open raft, and after forty-eight hours he goes completely blind as a result of the blow to his head. It rained that night; a very soft rain. Not even enough to drip through the palm frond roof. Timothy breathed softly beside me. I had now been with him every moment of the day and night for two months, but I had not seen him. I remembered that ugly welted face. But now, in my memory, it did not seem ugly at all. It seemed only kind and strong. His laughter filled the hut. That, I think, is the lesson that Theodore Taylor would like us to learn from his book. You also get a thrilling tale of survival against the odds. 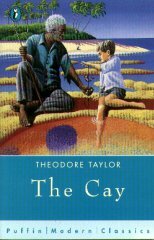 The cay where Phillip and Timothy are finally washed ashore has no fresh water supply and no food save what can be fished from the sea. Timothy is very old and fears the day when he may die and leave blind Phillip to fend for himself. Can he really teach Phillip everything he needs to know? The cat? Yep, he makes it. But you have to read the book to see what happens to Phillip and Timothy. A great book.